Leah grew up in the midwest with nature loving biologist parents who taught her how to forage for edible plants. Later, she moved to the Pacific Northwest, and a friend took her out one day for a chanterelle hunt. She was fascinated not only by the bounty of chanterelles that year, but also by the abundance of other mushrooms that she had somehow never noticed before. After asking friends more about mushroom identification and coming up with dead ends, she set out to teach herself. A chance encounter soon became a life passion. Leah became obsessed with mushroom taxonomy and all the facets that go into the hunt, learning to read the land for signs of treasure. 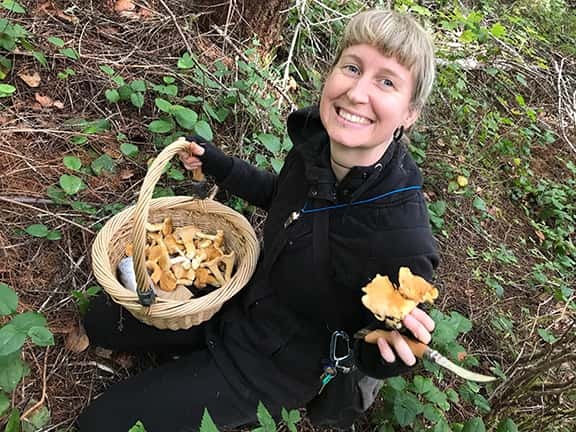 In 2015, she was elected to the board of directors of the Oregon Mycological Society, where she currently also serves as a teacher, speaker and identifier. After seven years of intense study, she now takes every opportunity possible to share the love of fungi with others and inspire them to begin their own journeys.